Can artificial surf reefs reduce crowds? If 8,000 surf spots in California struck you as ridiculously high, well you are correct. 800 is more realistic. Some how Paul and I got our zeros crossed, for which I take full responsibility. So where did these estimates come from? I estimated that there are 800 spots in California by taking the estimate off of wannasurf, which lists 467 surf spots in California and roughly doubling it to account for some spots that have several peaks and all those little extra waves we find adjacent to or inside surf spots that probably are not counted. For my back of the envelope estimation, I rounded this down to 800,000 to make the math easy. With 800 surf spots and approximately 800,000 surfs, that is 1,000 surfers per spot. If you add 100 more spots, by building 100 ASRs (that actually work), you would reduce the crowds by 10% - about 110 surfers per spots, which may sound like a lot but still leaves an average of 890 per surf spot and that is with 100 new surf spots! If the actual figures supplied by WannaSurf and NOAA of 467 surf spots and 1.114 million surfers in CA are used, the average is 1681 surfers per spot. 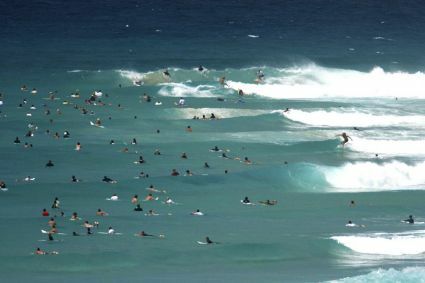 Using those figures and adding 100 reefs would reduce the average crowd by 17% but would still leave 1289 surfers per wave. When you consider that an ASR costs about $3-5 million to construct and that so far the results have been poor, I would not expect to see a half a billion dollars invested in the hope of reducing crowds by 10% any time soon. I am afraid we are going to continue to go about our normal tricks to find uncrowded waves in California or move to a place where the surfers/spot ratio is better than it is in most parts of California. Here's another opinion on ASRs and crowd reduction by Jim Moriarity, with similar conclusions. Read more back of the envelope math on surfing & crowds by the Surfer's Journal here.